UrRemote Research: What Would It Take To Cycle Fast When You Can't? What Would It Take To Cycle Fast When You Can't? Working with pro cyclists has inspired me to cycle more. However, I'd like it to be easier when I'm weary or climbing a hill and I'd like to keep up with the guy in front. Less body weight and increased aerobic fitness would help but no amount of training could get me up with the young guys. I don't want a motorbike but some stealthy assistance would be nice. I've trialled electric bikes from Switched On Cycles for a couple of weeks and the experience is good but not ideal. 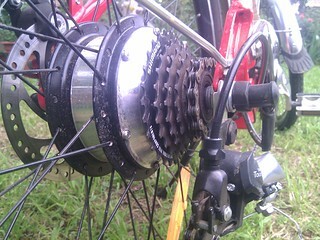 Figure 1 - A bike trialled with a rear hub motor. A front wheel drive bicycle was also trialled that had a Bafang, nominally 250 watt motor powered from a 36 volt battery. The bikes work well for a commuter seeking to journey with minimal effort but are non optimal for my ambitions. The motor was quiet but audible, I'd like quieter if possible. I tried using the throttle modestly but its hard to sense the level of assist and power at these levels is as addictive as heroin. A little bit feels good so you want more and taking it away causes pain. On the flat, the motor can get the bike along at a reasonable speed without pedalling so the temptation to slack is as hard to resist as a good snack. Exerting the willpower to ride hard causes the power to fade as the speed increases so that I still can't catch the guy in front. Pedalling up a modest hill though is much easier and climbing Black Mountain at average grades of 9% I can pass the young guys. Surprisingly though, I have to pedal hard and at the top I notice the motor is sizzling. I want a bike as close to a normal road bike as possible, that is silent, has a motor battery combination that is as light and unobtrusive as possible and doesn't run out of puff until I complete the ride. It's also apparent that whatever well planned strategies I might have for power management I behave like a junkie. My addiction, once I'm gasping for breath and the heart is pounding will cause me to abandon good intentions and seek immediate relief if all it requires is to twist the throttle. gives me the result in Figure 2. Figure 2 - My power vs speed model for a flat road and a windless day. Above 15 km/h it can be seen most power (Pdrag) is consumed pushing air out of the way and air drag increases with velocity cubed so that it quickly becomes dominant. A person weighing 82 kg produces about 95 watts to walk at a brisk 4.8 km/h and 57 watts at a more leisurely 3.2 km/h, according to table 1 of "The Energy Cost of Walking" after applying the suggested thermal efficiency of 30%. From Figure 2 this will get a bike along at 18 km/h on level ground. From Table 1 I can average 24 km/h on a good day over a fairly flat 5.2 km section of a 36 km ride around Lake Burley Griffin which, from Figure 2 equates to about 120 watts. The estimate of reference area and drag coefficient is crude so it is probably +/- 15 watts of the true value but its close enough for some comparisons. Table 1 - Speeds over the same fairly flat section. The fastest rides might have benefited from a favourable breeze. With a 500 watt motor the bike could get to 41 km/h but adding in my best average effort, would get a barely noticeable 3 km/h more. I doubt I could raise the motivation to do it. So at 500 watts I would already be riding a motorbike, albeit a dissatisfying one. It requires something like the Stealth Bomber at 4.5 kW to satisfy the power craving and by then the pedals are just for decoration. As for our reaction to artificial humans, it seems the level of satisfaction from extra power suffers an uncanny valley. Chris Horner's 172 km ride in stage 4 of the 2011 Tour De France has been published and analysed. He averaged 215 watts for the whole stage, so a mere 95 watts of assist could put me in the peloton with Chris. For the final 25 km he managed 318 watts so I'd need 200 watts of assist to stick with him there but its still not much. He also managed 502 watts for 2 minutes and peaked at 710 watts. I could up the power a bit for 2 minutes too but I'd need some significant extra assist to match Chris and a 10 second sprint finish, which Chris didn't do in stage 4, would crush me. Chris also used his power more efficiently than the model for me predicts, averaging 41.6 km/h. He does this by riding most of the race on the wheel of other riders to reduce air drag and may (or may not) have had a tailwind. He also has a small cross sectional area maintained by a good pose and the small volume needed for his weight of just 64 kg, including the bike. Low weight helps hugely on the hills as well. I'm not aiming to match Chris in all circumstances but an extra 100 - 150 watts peaking at 250 - 350 watts of silent, light weight electric power, strategically provided by an algorithm I can't abuse would put me in the ball park. Much more than that would put me well ahead of the Tour de France field but leave me dissatisfied in the uncanny valley on a gutless motorbike. I sought feedback on this article at Endless-Sphere and there was a substantial debate, which I've summarised here. Ken Taylor wrote: Do experienced ebike riders always get more satisfaction from more power? maydaverave wrote: I have a low power 1000 watt bike. Its a great commuter for my small town and as time goes by I find myself going slower on it. had a different definition of low power than I'd intended. Kraeuterbutter at viewtopic.php?f=28&t=37785#p587951 is somewhat sceptical of the power requirements of Endless Sphere aficionados. Jeremy Harris wrote: I started out with a fair bit of power, but find that the ebike I like best, and ride most, is the light one with the low power motor. The reasons aren't that straightforward, I think. melodious wrote: ....That article does have merit. A bike w/motor takes the physicality of the experience away. I'm really hesitant to taint my last true bike into a motorized vehicle. dogman wrote: A great deal depends on the goals of your ride. As goals change, the mental attitude changes. rocwandrer wrote: The vast majority of my riding time is purely recreational, with the destination being the departure point. rocwandrer wrote: If the benefit from adding pedal power does not FEEL proportionate to the effort, it is much harder to put in that effort....That all matches with Ken's hypothesis that if there is enough power on tap with the electric assist to make the human contribution feel less critical, or to make the return for extra effort feel too small, it is will psychologically difficult to even acknowledge that there is more in reserve in the human power side's controller. Pleasure is defined by acceleration. When acceleration is constant or increasing that is perceived as enjoyable. By simply changing the motors powerband to something more constant the pleasure will increase even if the overall power does not. You have to plan your motor to match your riding speed. It's not a mater of how much power, but more a case of planning that the motor produces its power at the speed you want. The motors that you've tried produce enough power. Even with your present setup, they will peak at close to 400 when they draw about 550w from the battery. The problem is that peak torque is produced at close to zero RPM and then it decreases as the RPMs increase, with peak power at about 2/3 max rpm, and max RPM about 220 RPM or 28 kph in a 26" wheel. Once past 2/3 max RPM, power and torque drops off rapidly, so top speed is only reached down-hill, with a following wind or by pedalling hard. For a higher speed motor, hill-climbing ability is compromised slightly and the motor will make a little more noise. The hill-climbing can be improved by increasing the current to about 18 to 20 amps (from its present 14 or 15, which will also increase noise slightly at low RPM; however, there's now a new generation of sine-wave controllers that make the motor run much quieter. Noise generally diminishes with increasing RPM. The new crank-drive motors by Bafang (8Fun) and TMC are very quiet, and can produce their max power at any speed, although they don't give as much peak power as a 250w hub-motor. I estimate that they'll give you a quiet 200W to 250W of output power at all speeds that your gearing will allow, so they should be a good solution to your problem. "I'm not aiming to match Chris in all circumstances but an extra 100 - 150 watts peaking at 250 - 350 watts of silent, light weight electric power, strategically provided by an algorithm I can't abuse would put me in the ball park. " This sounds like a Bionx with pedal assist only -- no throttle. Set the assist level and go -- you can pick anything from 25% to 200% assist on my Trek Valencia+. The TORQUE sensitive pedal assist insists that you provide power, not just wave your feet around. As you get stronger, reduce the assist level. I ride with stronger friends in assist level 1 (25%) and it just takes the edge off the hills. Range is 30+ miles on relatively flat terrain with a few 200 foot hills thrown in. Totally silent as far as I can tell, totally transparent, but not real stealthy. A real wash-and-wear solution. The only temptation you have to overcome is to increase the assist level -- much easier to resist than a thumb throttle, at least for me. On solo rides I set assist level 2 (50%) and return from the ride sweaty, shaky, breathing HARD and with half the battery left....averaging 17 mph on hilly terrain over a 12 mile course with a total vertical rise of 650 feet. Your Thinking power is much more than us. I hope you got something. I think you can do many big things in life. Please Do more such posts. Thanks for sharing.